Dubspot’s Maschine courses have been updated! We have just completed an overhaul of our Maschine curriculum, which now covers all of version 2.0. Learn about Drum Synth, the new mixer, and deeper integration with Massive in our new Maschine courses which start on January 19th! We are pleased to announce a major update to Dubspot’s Maschine music production program, which features Maschine 2.0—an update that brings many new capabilities to this robust platform. The program is a complete re-design of our Maschine program and includes the latest technology from Native Instruments. The course material has been optimized based on two years of input from producers who have taken our courses. Classes for our new Maschine program start on January 19th. This program is ongoing—sign up at any time! So what has changed with this update? One of the big changes is the approach we took after working with hundreds of students who have taken the course both in NYC and online. Teaching online for over two years and studying students has really informed how the information is delivered and received. Prospective students should feel confident that we have spent considerable time adjusting curriculum and optimizing the learning experience. 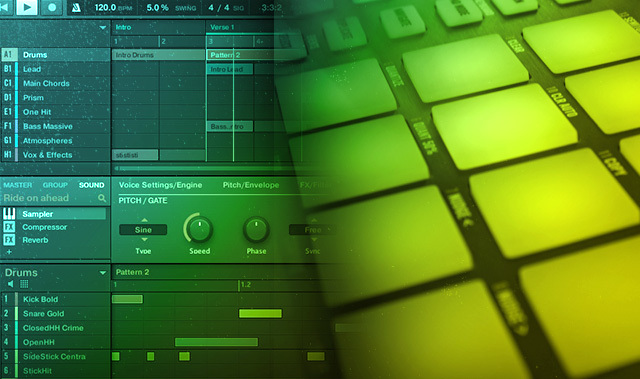 One specific change is the inclusion of finished Maschine projects that are presented at the beginning of a level and then broken down and built-up from scratch, showing the process of writing a track. We introduce the necessary lessons as they happen in a natural writing scenario. I always had students asking to see project files of the songs I shared with them, so this approach made sense. We’re not here to make a video manual for Maschine, this is a course about music production using Maschine. We have experienced, supportive teachers guiding you through the course. The lessons are only half the experience. The teacher/student interaction is essential to what makes Dubspot so special. What are you excited about with this update? I’m just excited to share this knowledge about such an amazing product with others. Maschine was a life-changing instrument for me and influenced the way I will write music forever. I can’t notuse it now. I love sharing the knowledge I have accumulated with students who are just getting started writing music. If something like Maschine and Massive had existed when I started writing music, I would be beyond excited because they are all you need to get your foot in the door. What sort of student is this course aimed at? Honestly, anybody who wants to learn Maschine. We have had experienced producers take the course and still come away with a ton of knowledge because Maschine has a unique workflow that doesn’t always make sense to everyone coming from a DAW. I have seen so many different workflows people use with this product, lots of different approaches, and I think we teach it in a very clear, concise manner.If a student is learning both music production and Maschine as a beginner, this course will provide them the ultimate head start for their musical journey. It’s like a crash course for all the essential things you need to know about making electronic music. Can you tell us more about integration of Massive in this program? Having Massive included with Maschine is a wonderful addition, not just because it’s an amazing synth, but because it provides a valuable teaching tool for students to learn synthesis fundamentals while creating tracks. We’ve incorporated freeware synths in the past, but these were not as powerful and straightforward as Massive. I really look at Maschine and Massive as one package now, so our students taking this course will be working with two products that are essentially all you need to get started in electronic music production. Do you need Maschine Studio to take this course? No. The online video tutorials utilize Maschine Studio because it is the clearest visual representation we could use to teach, but no, the Studio is not needed. The focus is on the software and, more importantly, the production techniques. Either the Studio or the mkII controller works perfectly. Everything done on the Studio has the same control functions on the other controllers, so nothing is lost in translation. Besides, the teachers all use both models and can help students along the way regardless of the hardware they use.